Last week, on January 25th, the remake of Resident Evil 2 came out. After playing through both the first runs of Leon and Claire, I can tell you that this is the way game remakes should be done. I decided to review this game in particular because I’m a huge Resident Evil fan. For those who don’t know, Resident Evil is a survival horror game franchise that truly helped bring survival horror to the forefront of gaming. After playing this remake, I can tell you that Capcom has done it again. Today we’re going to talk about the gameplay, graphics and story of this amazing remake. Now, this game looks like Resident Evil 7: Biohazard, has the camera angle of Resident Evil 4 and still has the soul of Resident Evil 2. In the game, you take on two characters. You can play as Leon S. Kennedy at the start of the game. He is a rookie cop going to Raccoon City to see why none of his fellow police officers have responded to him after he was warned to stay away. You can also play as Claire Redfield. She is the sister to the one and only Chris Redfield, one of the main characters of the original game. Claire has gone to Raccoon City in search of her brother. Of course, the city is over run with zombies and the whole goal of the game is to then escape Raccoon City and find out what happened there in the first place. Each of these characters’ stories is so much fun to watch and play. Especially with Leon being more focused on a cop and trying to find answers as to how everything started and with Claire who is more focused on saving a certain character in the game. Each character feels great to play as and both of them are so loved by the fans. Getting to watch their original debut over again is such an amazing feeling. The gameplay is truly incredible. Ammo and health are truly scarce, making you really think twice about shooting a zombie in the head and makes you consider just running away a little a while longer. However, whenever a boss battle would take place, the game gives you more items to help fight them off. These bosses are just giant bullet sponges and they will ensure that you use all the ammo during the fight. Each encounter I had with a base zombie was actually quite nerve-racking. In the genre of games saturated with thousands of zombie titles and usually thousands of the walking dead on screen all at once, this felt truly fresh. Zombies wouldn’t always pop up and when they did it took a lot of bullets to just put them down. Even when you did manage to get one down, they would most likely get back up. So when you did see even just three zombies on screen, you knew you were in for a fight. Honestly though, this aspect made the game that much more fun every time you beat one. These zombies were tough and when adding one of the most terrifyingly fun monster to ever grace my screen, the Tyrant Mister X. This giant, gray faced man in a black trench coat and hat stalks you throughout most of the game. He never over stays his welcome though. There is nothing truly more terrifying than hearing his footsteps in the next room as he is slowly hunting you down, getting even closer to killing you. Since you can’t fight him, your only option is to run and hide. He adds an extra layer of fear to the game that I just adore. Speaking of fear, the game is beautiful to look at graphically. Everything is rendered with such love. To make the game even cooler, when you shoot a zombie, parts of its face, arms or legs would get torn off. So, you can actually see the damage you’re doing to these things. The devs put so much love into making this game look as scary as it feels to play. 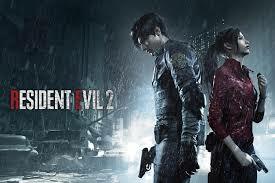 With all that being said, I’m giving the Resident Evil 2 remake a 10/10 for being truly a great return to form for the series as a whole and reminding us that even a few zombies on screen can be scarier than a thousand of them.